Objective: To be the first player to get 5 chips in a row horizontally, vertically or diagonally. 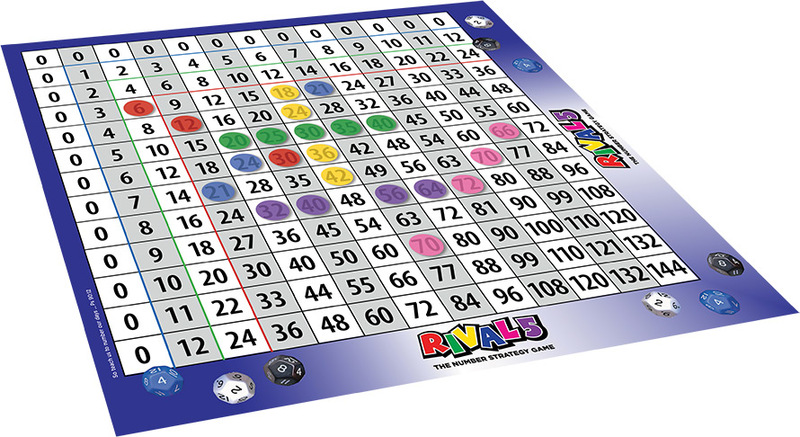 How to Play: Each player selects 1 color of chips and may use only 1 chip per turn. Players take turns rolling the dice and must use all 3 dice. With any sequence or combination, players add, subtract, multiply and divide the 3 numbers to reach a number that will help them get 5 chips in a row while blocking their opponents from doing the same. If a player rolls 3 dice of the same number (triplets), he plays that roll and gets an additional turn. If he rolls triplets again (on the same turn) he removes from the board 1 chip of each opponent, and the next person takes his turn. The first player to get 5 chips in a row horizontally, vertically, or diagonally wins.